Splenectomy is the surgical removal of the spleen. The spleen is an organ in the upper left part of the abdomen. It lies beneath the ribs and behind the stomach. The spleen filters blood. It removes items that can cause infection such as bacteria or parasites. It also removes old and damaged blood cells. 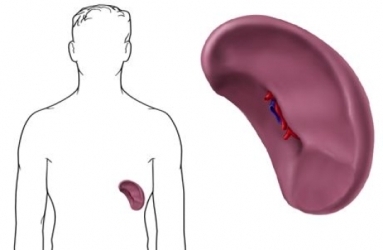 The spleen can be removed through an open incision or through laparoscopic surgery . An incision will be made in the abdomen over the spleen. The skin and muscles will be pulled back. The blood vessels to and around the spleen will be tied off. This will free the organ. Moist sponges may be placed in the abdomen. The sponges will absorb some of the blood and fluid. The spleen will be removed. The sponges will then be removed. The muscles and skin will be closed with stitches or staples. A gauze dressing will be placed over the wound. A small incision will be made in the abdomen. A thin, lighted tube with a small camera will be inserted through the incision. It allows the doctor to see inside your body. Carbon dioxide gas will be passed into the abdomen. This puffs up the abdomen. It will give the doctor more room to work. Two or three more small incisions will be made. Special tools will be inserted through these incisions. Blood vessels to the spleen will be cut and tied off. The spleen will then be rotated and removed. The incisions will be closed with stitches and covered with surgical tape. The removed spleen is sent to the lab for testing. You will be taken to a recovery room and monitored. You may need a blood transfusion if you lost a lot of blood. Anesthesia prevents pain during the procedure. There will be some pain and discomfort until you have healed. Medicine can help to manage discomfort. The usual length of stay is 2 to 4 days. The stay may be longer if there are complications. Complete recovery may take up to 6 weeks. Some activities will be limited until you heal. Do not return to full activity or do any heavy lifting until your doctor says it is okay. Arrange for help at home for a couple of days. You may be given specific exercises to do at home. It will help with healing and let you maintain strength. Pain can be managed with medicine. Do not take aspirin. Your doctor may also recommend daily antibiotics. Always let your doctor(s) know that you do not have a spleen. Carry a national splenectomy card. When traveling, take special precautions against malaria and other infections. Cadili A, de Gara C. Complications of splenectomy. Am J Med. 2008;121(5):371-375. Sabiston DC Jr. Textbook of Surgery. 17th ed. Philadelphia, PA: WB Saunders Co.; 2004. Splenectomy. The Cleveland Clinic website. Available at: https://my.clevelandclinic.org/health/articles/splenectomy-spleen-removal. Accessed September 19, 2013. Splenomegaly—differential diagnosis. EBSCO DynaMed Plus website. Available at: http://www.dynamed.com/topics/dmp~AN~T270052/Splenomegaly-differential-diagnosis . Updated June 5, 2017. Accessed September 5, 2017. 10/9/2009 DynaMed Plus Systematic Literature Surveillance http://www.dynamed.com/topics/dmp~AN~T116823/Splenic-injury-and-rupture : Renzulli P, Hostettler A, Schoepfer AM, Gloor B, Candinas D. Systematic review of atraumatic splenic rupture. Br J Surg. 2009;96(10):1114-1121.